Did that really just happen? I had to rub my eyes a little bit! Red Wings win! 1-0, over the Montreal Canadiens. Another strong start for goalie Jared Coreau, and a big two points for the Wings, which puts them only 4 points back of the 3rd playoff spot in the Atlantic Division that is currently occupied by the Toronto Maple Leafs. Starting off with the game recap, if I could use one world to describe this game, the word would be defense. 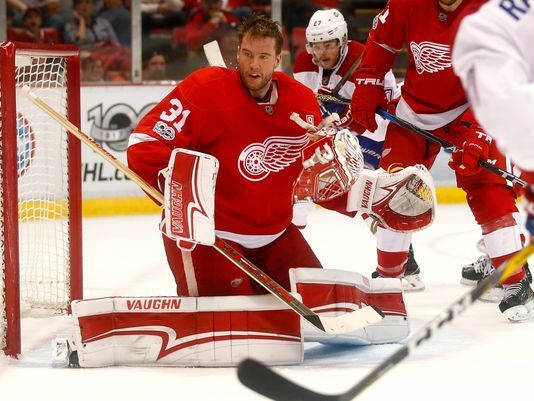 Even though both the goalies had tremendous games, Wings goalie Jared Coreau only faced 18 Montreal shots and Habs goaltender Carey Price faced a mere 20. The first period marked a number of Wings scoring chances, as they physically dominated the Habs for almost a full 20 minutes. The Wings out skated, out muscled, and outmatched the Habs, but failed to hit the net on most of their scoring chances. When the did hit the net, there was Carey Price to thwart another scoring opportunity. Then, all of the sudden, the Wings’ Andreas Anthanasiou took the puck off a Habs defender at the Montreal blueline, and was 1 on 1 with Price. He’s in, goes to the backhand, and…saved. Price flashed the leather to rob AA, and neither team can put one in. No score after 1 period. Now, a big issue for the Wings this season has been scoring, but I was not so upset after the first period. They dominated the Canadiens and got quality scoring chances, but they either missed the net or it was stopped by one of the best, if not the best, ‘tender in the NHL right now. Coreau had a strong period against the shots he faced, but not many of them were actual quality scoring chances. Coming to the second period, both teams held their ground for most of the period, not allowing to many good shots on the battling net minders. The thing that I really noticed in this period was the Wings powerplay. It’s stuggled throughout most of the year, with the Wings going over THREE MONTHS without a goal with the man advantage. Although the only goal in the game came in even strength, the Red Wings controlled possession and moved the puck well, which really gives me hope for the future of the powerplay this year. Flash forward in the period, minute and 50 seconds before the intermission, Wings defensemen Danny Dekeyser fires a shot from the point, which bangs twice off Wings forward Thomas Vanek in front of the net, bounces off the top of Price’s left pad, and into the back of the net. Vanek with the goal, the assists from Dekeyser and Frans Nielsen, and the Wings are up 1-0. Every hockey fan knows that when you play Carey Price, goals are probably going to be scarce(except for the other day when he gave up 7, but whatever). Coming into the third period, I was hoping that they could get a second lamplighter, but I knew that the defense and Coreau would have to step up. As soon as the puck was dropped in the third period, the heat was on the Red Wings. A win and two points would be ginormous for this team’s confidence, especially a win against a good team like the Canadiens. The Red Wings got some chances in the 3rd, but I felt like there was no pressure on the Habs. The shots started to climb a little higher for the Canadiens, but for each shot, a Coreau save. For the penalty taken in the third, a sufficient kill. Before I knew it, the clock was ticking under a minute, and the Habs net was unoccupied. The Red Wings were holding their position, and the Joe Louis crowd was standing and cheering. The puck was behind the Canadiens net with 10 seconds to go, just enough time for one more break. The Canadiens bring it to their own blueline, and a Wings forechecker poked the puck all the way back into their own zone. The Habs attempted to break it out, but it was too late. The clock hit 4 zeroes, and the Red Wings iconic goal horn sounded to mark an enormous Wings win, and 2 points. Two straight impressive wins by the Wings have given me hope that they have the players to turn this season around, and extend the streak. They can string together 3 straight wins together if they can win Wednesday at home vs. the Boston Bruins, which would be an even bigger one than this one, and it’s never a bad thing to beat the Bruins. Puck drops at 8 p.m. Central time in Detroit.